T2738-RB is rated 4.9 out of 5 by 19. Complete your bath with a beautifully designed Delta roman tub faucet, meticulously crafted to turn heads and enhance your experience. 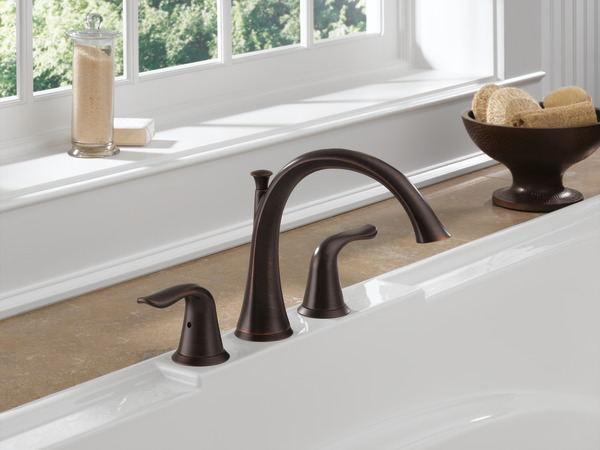 An ornate blend of deep, warm tones and subtle highlights give Venetian Bronze® a hand-brushed look that can transform a bath. Offering a smooth contrast to light tones and coordinating well with darker ones, this finish can have a beautiful soothing effect on almost any space. You can install with confidence, knowing that Delta faucets are backed by our Lifetime Limited Warranty. 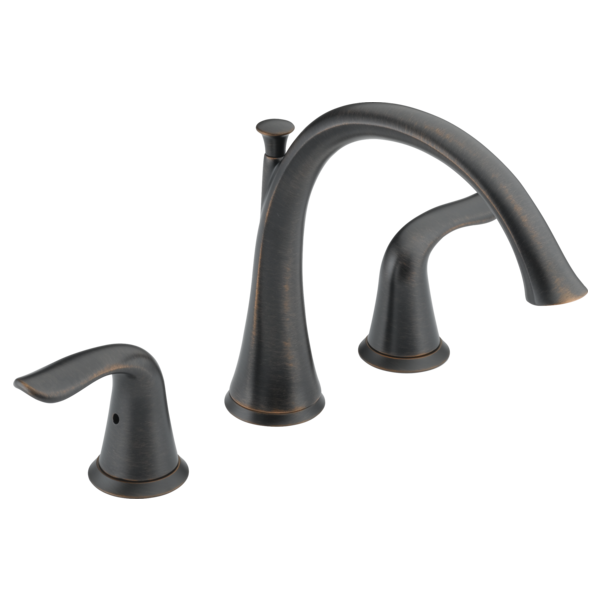 Rated 5 out of 5 by Annrandy from Sahara Tub Faucet We put this Lahara Roman Tub faucet in our new home and or prior home. The quality and style are unmatched. We highly recommend. Rated 5 out of 5 by FallCityHome from Graceful lines make this a beauty. 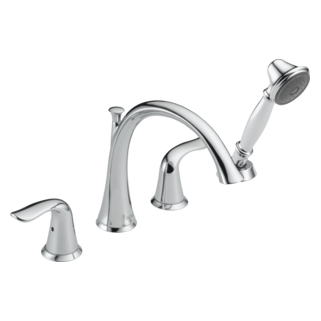 We purchased the Lahara suite to replace 1980's faucets and are so pleased. 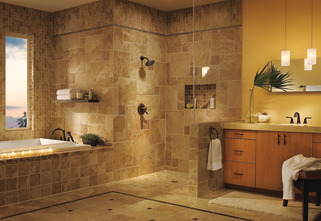 We love Delta products for their looks and reliability. Rated 5 out of 5 by Justin from Great item Awesome finish, great working faucet. Won't have any other brand. Rated 5 out of 5 by PJMD from Beautiful like a swan! Love this fixture, a great combination of clean lines and yet substantial and solid. 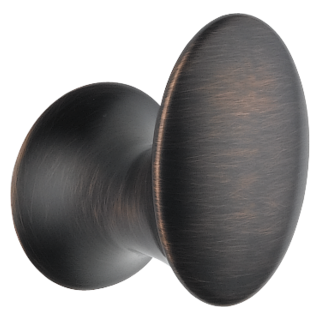 I just love the Venetian bronze finish- so pretty with its copper undertones. 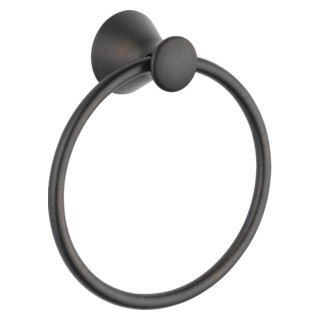 So much prettier than the oil rubbed bronze finishes that are a solid color with a painted orange edge. This finish is just gorgeous- you won't be disappointed. Rated 4 out of 5 by chattyg from Nice looking Faucet looks good on the drop in tub. I like the style of the handles. 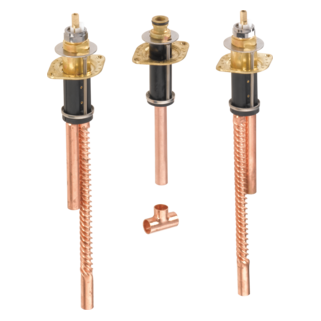 Rated 5 out of 5 by SmallTimeBuilder from This entire collection is solid Wonderful look, solid construction; however, the rough in kit for this (R2707) can be very tricky to install properly, requiring a good plumber. 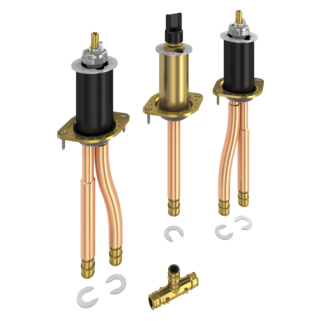 If you attempt this without professional help, be certain your alignment is perfect with no twisting or spacing issues, and that your valves are fully open before attempting the complex soldering (a small "T" joint with stiff/stubborn copper arms). My Tub has spout location is on one end of tub and cold &amp; hot handles located across from the spout. so it is not like in your website picture... what # valve should I purchase for tub trim? Is the washerless stem cartridge included? What is the screw size of the faucet aerator. 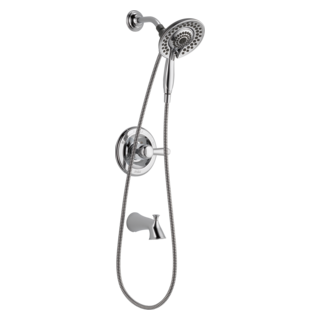 I am looking to remove the existing aerator so I can screw in a diverter that I can use to connect a secondary shower head and hose to use to clean out my tub. What is the size of the aerator screw in hole so that I can purchase the correct connection/adapter. I have included a photo of the diverter I am looking to screw in. The specifcations of the diverter are BRASS Sink Valve Diverter Faucet Splitter for Kitchen or Bathroom Sink Faucet Replacement Part Faucet to Hose Adapter M22 X M24, Polished Chrome, PV10. 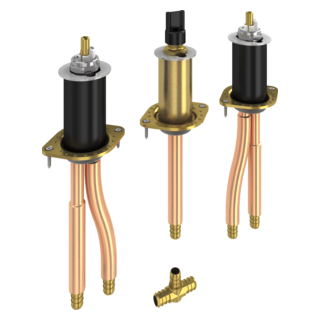 If there is a Delta diverter that can do the same similar thing please provide me that part number. I have attached a photo of the existing tub trims, please let me know if I can replace that with Lahara Roman Tub 3 hole trim? Thank you for your question. Based on your picture, you should be able to replace your current roman tub with any Delta Faucet roman tub trim. 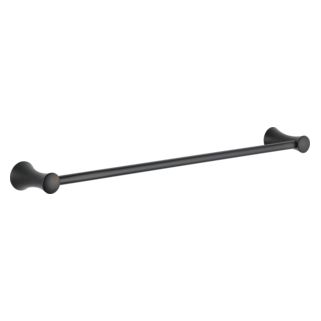 The technical specifications say that the faucet is 9 1/4&quot; long, but the diagram says the length is either 8 1/2&quot; or 11&quot;, depending on where it's measured from. 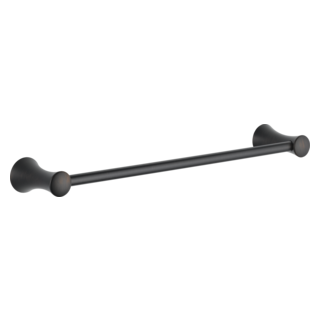 How is the 9 1/4&quot; dimension measured? Also, I have a 20-year old faucet similar to the one in the picture in Sudhi's question. 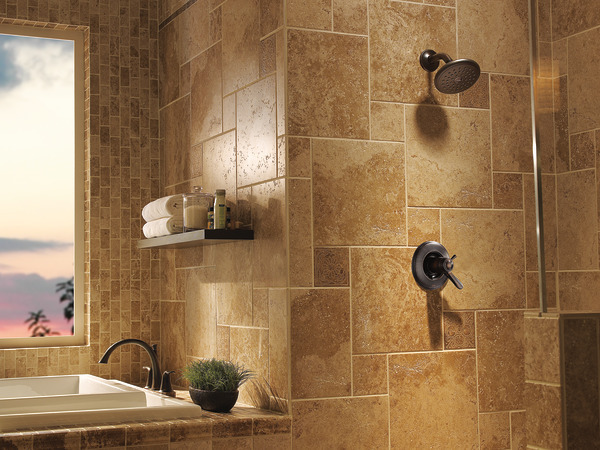 The answer suggests that any Delta faucet will work. However, this old one has a rod next to the main plumbing hole that looks like it's meant for additional stabilization. Does the newer faucet have that? Also, is it likely my existing rough-in will work? Thank you for your questions. 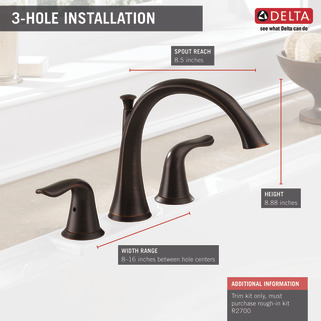 Delta Faucet model # T2738 has a length of 8 3/4&quot; from the middle of spout to the middle of the aerator. Thank you for bringing the incorrect spec to our attention. We will get it fixed as soon as possible. 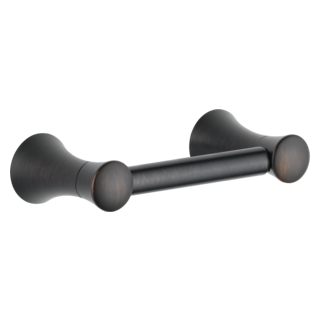 Regarding your current faucet, it sounds like you have an anti-swivel pin in your faucet now. 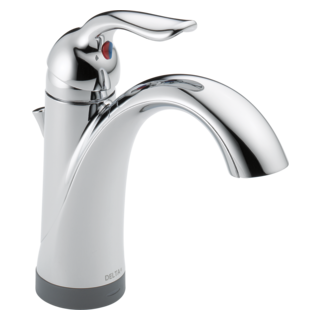 The was used for stabilization and if it is there, then you can only replace your faucet with Delta Faucet model # T2710 without changing your existing valve. This faucet is only available in Chrome. Does the Lahara Roman Tub trim come without the drain pin? For applications where the drain lever is located on the tub drain assembly. The delta T2738-SS roman tub faucet can be mounted on the tub OR deck mounted -correct???? I have 3/4&quot; plywood deck with stone 1-3/16&quot; thick.